I know it's been a little while since my last post. Of friend of mine placed an order for My Tea Tree Body Cream so I thought I would take the opportunity to put it out there for you to see. I start out buy zeroing out my scale and setting it to grams. 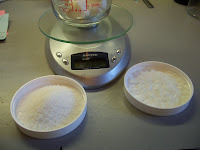 When making smaller batches of lotions it is better to work in grams because you are using small amounts. 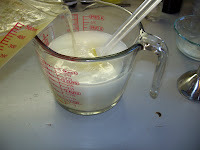 I like to use glass measuring cups when making lotions and balms. The first reason is it is easier to pour if you have a spout. The second reason is when you heat things up the glass keeps things warm longer than if you worked with plastic. This is a real advantage when making balms. 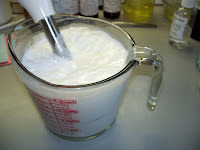 Unlike soap making where you have to be absolutely careful about your measurements, lotion making is okay if you over measure a gram or two. 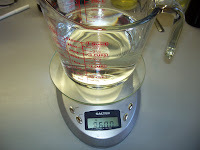 When I make my lotions I start out by measuring out my water. I put the water in the larger measuring cup. It is important to make sure that when you combine your water and oils that the total amount will fit with enough space for blending. I do use my immersion blender to make sure that it is completely blended and if you don't have enough room you will have a mess. I wanted this to be a thicker richer lotion so I used more butters than oils. Originally this started as a foot cream. It was nice so I decided to make it a body cream instead and made a few adjustments. As Emeril says, "I kicked it up a notch!" Boy did I hit the right spot. The next day I had my Indie market and sold several jars. The next day I had our Church bazaar and sold several more jars and within 2 days I started getting orders. I know the FDA is sticky about letting you make any claims medically. They take the fun out of it. All I can say is people love this stuff. 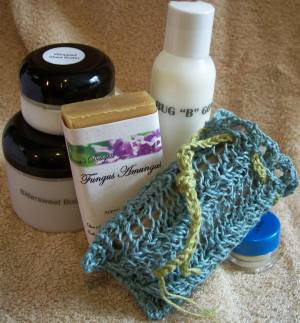 It is perfect for the winter time and for anyone that has really dry skin. It smells great also. I use a combination of for Essential oils that is really nice. I start out by measuring my water and then heating it in the microwave while I am measuring out my other ingredients. The cap on the right is my emulsion wax. 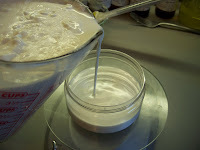 This is used to stabilize the mixture. The cap on the left is my stearic acid. 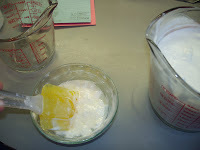 This is used to make the mixture thicker. In a smaller bowl I measure out the ingredients that shouldn't be added till the mixture reaches a lower temperature. This is when I add my preservative, allantoin and essential oils. The FDA has approved the following statements to be used for non-prescription drug. Now here is where the magic begins. After I make sure all my oils are melted and mixed together I pour it into the heated water. As you pour it it quickly turns into what is best described as warm milk. This is what the emulsion wax does. It allows oil and water to mix. If you didn't have an emulsifier you would have an oily water mixture that would never hold. I do use my immersion blender to make sure it is all mixed well. As you can see once the blender is going there isn't a lot of space left. Before I stir in my final ingredients I add some of my oil and water mixture. The allantoin is a powder and it helps to be able to make sure there aren't any lumps. I don't show here but after I add it in I do give it another spin with the blender to make sure it is evenly blended. Now to pour into containers. It is always best to hurry up and do this before it gets too cool. It is much easier to pour a liquid than a solid. 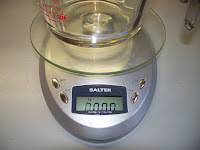 To insure the proper amount I zero out the scale with the container on it and pour while it is still on the scale. Let it sit and cool completely before you put your lids on or you will have condensation build up in the jar. 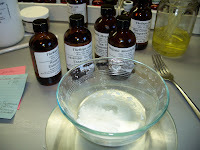 Hope you enjoyed my journey into making lotions today. I made body scrub the same order but wasn't thinking and forgot to take pictures. 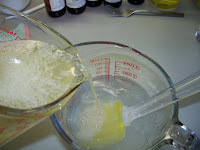 Hey donna that is really cool way to make lotion at home, give some skincare tips associated with this lotion also.